In this article we will show that the Macro-Economy and its growth can be modelled and explained exactly in principle by commonly known Field Theory from theoretical physics. We will show the main concepts and calculations needed and show that calculation and prediction of economic growth then gets indeed possible in Dollars and Cents. As every field theory it is based on an equation of continuity, which in economic terms means the full balance of all sources and sinks of Capital (Assets) and real Goods (GDP) in the bulk. Uniqueness of field theory of macroeconomics then can be derived from adapting Noether's Theorems, which is based on the notion of invariants to derive unique field equations. We will show that the only assumption which is needed for a self-consistent non-linear macro-economic theory is that the well known Quantity Equation, used in corrected formulation, holds at least locally in time. The E-book "Economics of Growth and Crisis" (US-Version) is available at Amazon as a convenient readable Ebook for handheld devices. (D) D. Peetz, H. Genreith, Neues Makromodell: Die Grenzen des Wachstums: Finanz- vs. Realwirtschaft, Die Bank, Zeitschrift für Bankpolitik und Praxis, Ausgabe 3/2011, S. 20-24. 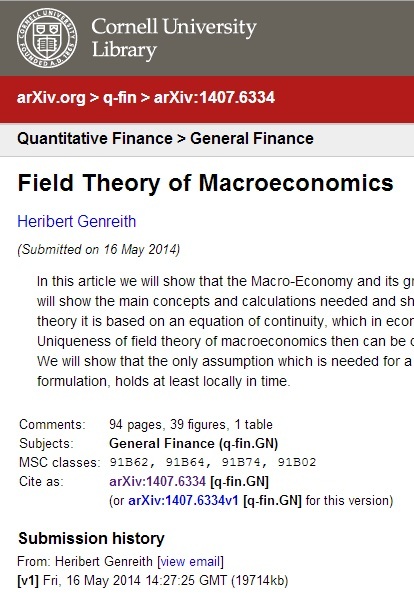 (E) H. Genreith, Economic Engineering, Academic Preprint, English Translation of "Makroökonomische Feldtheorie" with some advances, Preprint, Books on Demand, Nr. 949158, Norderstedt, August 2012. (D)(E) TandemVipera Blog,: Language can be changed to english (E) by google-translation button. (D)(E) TandemVipera Blog, LABEL Macroeconomics (VWL): Language can be changed to english (E) by google-translation button.